In January of 2015, Nevada Congressman, Mark Amodei and Colorado Congressman, Jared Polis, introduced legislation to make the EB-5 program permanent and allow for job creation through foreign capital investment. With the program set to expire in September of this year, the congressmen recognized the tremendous economic benefit and opportunity that the EB-5 program (or immigrant investor category) has to our nation’s future. Additionally, the bill titled American Entrepreneurship and Investment Act of 2015, would address Target Employment Areas, transparency and streamline the program’s processing times. The EB-5 program is a highly regulated employment-based permanent residence application that takes years to complete. The initial application requires detailed proof of investment in a qualified project. It also requires evidence of an investment of either $1,000,000 USD or $500,000 USD and the creation of 10 jobs for U.S. workers. Moreover, EB-5 applicants go through a rigorous vetting process to demonstrate that their source(s) of funds is(are) lawful and that those funds can legally be invested into qualified projects. An investor can NOT simply purchase entry into the United States. In fact, every investor is carefully screened and must meet a lengthy list of requirements. If, and only if, approved the investor is issued a “conditional green card.” The same in-depth review of the project and the investor’s background is conducted two years after the conditional status is granted to ensure the individual eligibility for the EB-5 immigrant investor category is intact. In addition to the investment requirements and stringent screening processes, the total number of investors gaining legal entry and immigration must comply with the annual limit of 10,000 set by the USCIS. This set number of EB-5 (employment-based immigrant categories) visas does not allow participants to jump ahead of traditional applicants. All EB-5 securities offerings are treated as traditional securities offerings. There are no EB-5 program-specific exemptions to U.S. or state securities laws. Whether you are selling a limited liability company or limited partnership interests to raise equity for a local investment, all state and federal securities laws apply and the persons responsible for preparing the documentation, including the Private Placement Memorandum (PPM), should take reasonable steps to confirm that the information included is completely accurate and does not misstate or omit facts that would be considered material to an investor’s decision to invest. Federal and state securities laws require the issuer of securities to provide prospective investors with full, fair, and complete disclosure of all “material” facts about the offering, the issuer of the securities, and the issuer’s management personnel, business, operations, and finances. Each investment opportunity may be dependent on various securities laws including: (i) the Securities Act of 1933, as amended, and state “blue sky” laws regarding the offer and sale of securities; (ii) the Investment Company Act of 1940, as amended; and (iii) the Investment Advisers Act of 1940, as amended, and state equivalents. Unlicensed brokers and finders and other introducers of foreign capital investment are regulated by the EB-5 Program and the securities laws. Entities raising capital from investors seeking a visa under the EB-5 program should consult with legal counsel to ensure that they are complying with all applicable securities laws. These entities must also comply with relevant foreign securities laws and should evaluate whether introducers of capital (commonly referred to as “finders” or “broker-dealers”) must comply with the broker-dealer registration requirements of the Securities Exchange Act of 1934. The EB-5 Program works diligently to prevent fraud within the program and uphold our nation’s security efforts. Both the U.S. Department of Homeland Security (DHS) and the U.S. Department of State (DOS) have a variety of resources, the delegated authority, and the regulations in place to monitor, review, and investigate any potential criminal or fraudulent activity that might be perpetrated by an EB-5 investor. Likewise, the SEC along with the Federal Bureau of Investigation (FBI) and the DHS, have existing tools in place to deal with fraud, criminal activities, and security threats that may be perpetrated by investors, entities that offer investments, and Regional Centers. Investment of either $1,000,000 USD or $500,000 USD and the creation of a minimum of 10 U.S. based jobs. Stringent background check: Multiple government agencies participate in the background check, investment verification and more. Currently, the USCIS grants 10,000 visas a year and the immigrant entry is not to exceed 10,000. EB-5 investment opportunities must follow traditional securities laws and processes. Brokers, finders and broker-dealers must comply with various securities laws. Preventing fraud and upholding national security is paramount. The process to becoming an EB-5 approved company/project is less complicated than one might think. Additionally, an NVEB-5 approved project can profit from the many benefits compared to the, ever-evolving and economic challenges associated with traditional capital procurement. Participating companies/projects obtain foreign capital contributions which are identified, scrutinized and provided through strictly-managed USCIS processes. Only projects that meet stringent requirements, whether existing businesses looking to expand or new ventures—-will be accepted for participation. 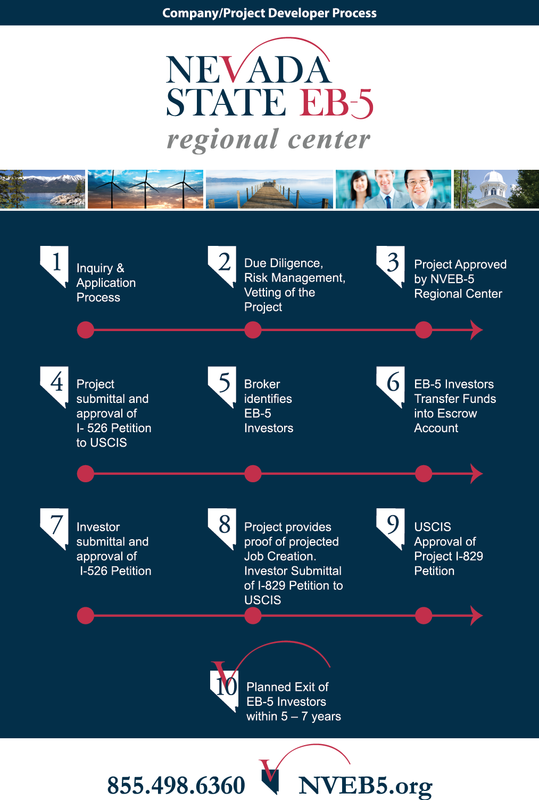 Follow the simple 10 step process below to see if your company/project would benefit from participating in the Nevada State EB-5 Regional Center program. Should you have questions about becoming an approved company/project, please contact the NVEB-5 at: 855.498.6360. What companies/project developers should consider when choosing an EB-5 Regional Center for financing a project. While benefits of becoming an approved project under the EB-5 Program are vast, navigating the EB-5 system can often become overwhelming and time consuming. The Nevada State EB-5 Regional Center (NVEB-5) offers participating projects with many benefits not offered by typical centers throughout the country. The highly skilled, professional and friendly staff of the NVEB-5 Regional Center is principally focused on growth of both existing businesses and new business ventures through foreign capital investment. The Nevada State EB-5 Regional Center (NVEB-5) is unique in that it is a blend of a non-profit and an approved U.S. Citizenship and Immigration Services (USCIS) organization utilizing industry proven processes and procedures. In fact, NVEB-5 is one of only two non-profit regional centers in the country. This status provides peace of mind in knowing that the viability of the project, local job creation and return for the foreign capital investor is first and foremost. NVEB-5 does not own or have any direct economic or other related self-interest or connection with a project. Rather, NVEB-5 is focused on providing a means for financially sound, viable and secure job creating project opportunities which fully satisfy all the requirements for investors to obtain their Green Cards through the United States EB-5 Immigrant Investor Program which is administered and overseen by USCIS. In today’s ever changing economic landscape, participation in the NVEB-5 can be a positive option for businesses looking to secure the funding to expand or new ventures looking to start up. NVEB-5 Regional Center is one of only two non-profit EB-5 Centers in the United States. Uniquely, as a non-profit, the mission of NVEB-5 is to create viable and sustainable job creating business opportunities for the area and to reinvest revenues and profits into the region in the form of business startup funding, career skill building and business development programs. In September 2010, NVEB-5 was founded through a partnership between Northern Nevada Development Authority (NNDA) and Hop & Mae Adams Foundation (HMAF). They focused on developing a solution for one of the key challenges facing economic recovery and economic diversity—the ability to secure capital funding. This was achieved in July of 2013 with certification from USCIS. The Nevada State EB-5 Regional Center is a member of Invest In the USA (IIUSA ®), a national based not-for-profit industry trade association for the EB-5 Regional Center Program. The IIUSA promotes policies that focus on advocacy, industry development and education for the EB-5 program, its over 220+ Regional Center members and 200+ Associate members. The NVEB-5 Regional Center coordinates all communication with EB-5 investors, agents, services providers, and the USCIS. Our staff is knowledgeable, helpful and friendly. We are here to help the investor have a positive experience. Many EB-5 investors are successful business professionals that can bring to the company/project developer not only their experience conducting business in international markets, but also their international network of other business professionals. The structure encourages a win-win outcome for both the business and its investors with the important added benefit to the community of increased job creation.